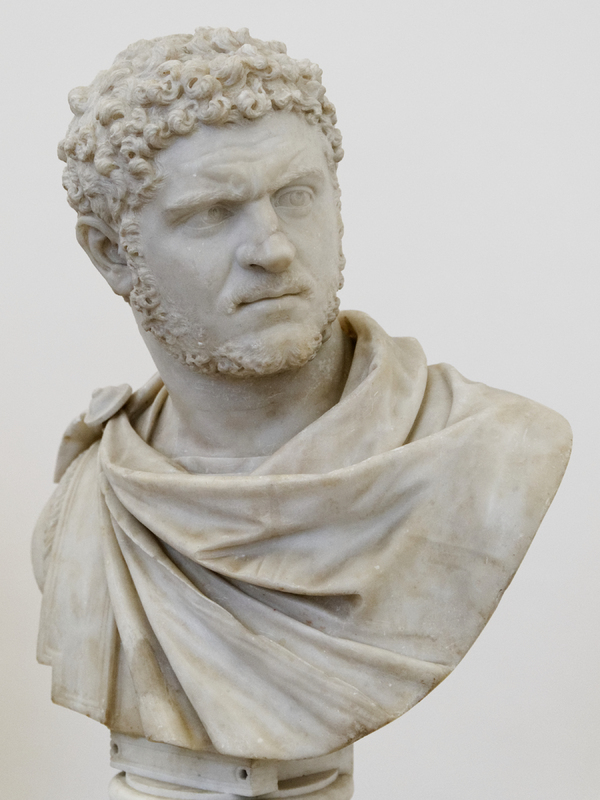 Emperor Caracalla ruled from 211-217 CE.1 His real name was Marcus Aurelius Antoninus, but became known as Caracalla because he often wore a military cloak called a caracallus. He ruled together with his father Septimius Severus from 198-211 CE. In 211 CE, while the two were on campaign in Britain along with Caracalla’s brother Geta, Septimius Severus died. At first, Caracalla was co-emperor with his brother Geta. However, this ended in early 212 CE, when Caracalla killed Geta in the arms of their mother. He then went on to lead two successful campaigns, one against the German tribes in 212 and one against the Parthians in 216. A member of the imperial guard then assassinated him in 217 on his way to a second Parthian campaign. Other than building the baths, another significant thing that Caracalla is known for is for granting all free people in the Roman Empire Roman citizenship in 212 CE.2 This is significant because this meant that all free peoples in the empire were now full Roman citizens, a right that was previously only granted to provincial civilians as a reward or to freed slaves. It is sometimes said that Caracalla’s motivation for this act was to collect more taxes, but some argue that this is a drastic action just to raise taxes, so we might never be sure for Caracalla’s motivation for this act.3 However, it did change the way the Roman Empire functioned, as new methods popped up to segregate different groups of people. 2 Mary Beard, SPQR: a history of ancient Rome,(New York: Liveright Publishing Corporation, a Division of W.W. Norton & Company, 2015) 301. 3 Mary Beard, SPQR: a history of ancient Rome, (New York: Liveright Publishing Corporation, a Division of W.W. Norton & Company, 2015) 302.